Marc has twenty years’ experience as an Auctioneer and Valuer and is head of the Valuations Department. He qualified with a distinction in the Fine Art Division of the Royal Institute of Chartered Surveyors exams and has a jewellery diploma. 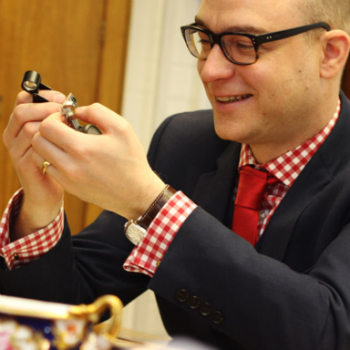 He has an excellent general knowledge and specialises in jewellery, English porcelain and furniture. “I was an unusual schoolboy, as I was fascinated by antique silver and English ceramics and the social history behind them. When I was fifteen, I met James Grinter, our Managing Director, at a meeting of the Billericay Ceramics Circle with my parents, who asked him if I could have a holiday job in the saleroom – that holiday job has lasted twenty-one years to date and hopefully the rest of my career. I like the fact that each item is often unique and can have an interesting history, which with research, can often unlock a huge wealth of information. One such find was an Indian gold, diamond, emerald and enamel inlaid necklace and earrings, which had formed part of the spectacular Lahore Treasure which was confiscated by the British in 1850 from the Maharajah Ranjit Singh. The treasure included the fabulous Koh-i-Noor diamond, now the centrepiece of the British Crown Jewels. Our necklace and earrings had little intrinsic value in their component stones, which were very small, but went on to fetch £25,000 and were bought by an Indian collector who fully appreciated the importance of their provenance. At Reeman Dansie, our specialist team responds to the changes in the market and always gives up-to-date advice to our clients and vendors. This ensures that each item is well represented and sold to its best advantage. We’re a very honourable firm, with helpful staff and a personal service that respects the sensitive nature of our profession. Building a good rapport and level of trust with our sellers means we have a lot of repeat business. On viewing days, it’s almost like catching up with old friends.